Drop-off is 8-8:30 a.m. each day, and pick-up is 4:30-5:30 p.m.
Campers will explore and learn about the Lowcountry environment, create arts and crafts, and play cooperative games. This experience introduces kids to the wonders of being outside and builds physical, social, and decision-making skills while providing recreational fun. Our programs are designed with the philosophy that physical and emotional safety has to be the base on which all fun and education can be achieved. 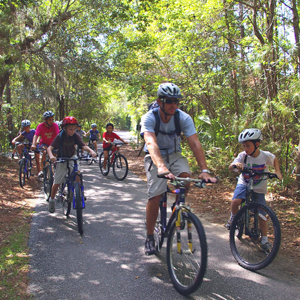 We reserve the right to use photos or videos taken of visitors while they are at Charleston County Park & Recreation Commission facilities or events for publicity purposes. Park fees, operating schedules, and hours are subject to change without notice.